After 36 excellent speeches, this debate has revealed serious objections, from all parts of the House, to the constituency changes proposed in the Bill. Indeed, as the right hon. Member for Belfast North (Mr Dodds) and my hon. Friend the Member for Great Grimsby (Austin Mitchell) pointed out, almost nobody, on either side of the House, spoke fully in favour of the Bill, with the exception of the Deputy Prime Minister. The hon. Members for Broxbourne (Mr Walker), for Aldridge-Brownhills (Mr Shepherd) and for Christchurch (Mr Chope) all made impassioned speeches about the dangers of diminishing the numbers of Back Benchers compared with the Executive and about the balance of power in this House. The right hon. Member for Haltemprice and Howden (Mr Davis) made a telling point: that abolishing public inquiries will actually trigger a much greater spate of judicial actions based on objections to the new constituencies from local electors. My hon. Friends the Members for Glasgow North West (John Robertson) and for Rutherglen and Hamilton West (Tom Greatrex), and the hon. Members for Camborne and Redruth (George Eustice) and for Na h-Eileanan an Iar (Mr MacNeil) all pointed out the serious problem of staging the referendum on the alternative vote on the same day as national elections in Scotland and Wales. My hon. Friend the Member for Caerphilly (Mr David) pointed out the astonishing reality that the Deputy Prime Minister and the Government failed to consult the Governments of Northern Ireland, Scotland and Wales on the decision simply to impose the referendum on the same day as their elections-and by the way, also on the same day as elections for local councils of different electorates. My hon. Friend the Member for Nottingham North (Mr Allen), the distinguished Chairman of the Select Committee on Political and Constitutional Reform, made the point that not only has there been no consultation across the country or with the elected Governments of Northern Ireland, Scotland and Wales, but there has been no consultation with this House. There has been no pre-legislative scrutiny or any recognition of the need to build constitutional reform Bills by consensus-a point also made powerfully by the right hon. Member for Belfast North and my right hon. Friend the Member for Torfaen (Paul Murphy). With his Northern Ireland experience, my right hon. Friend made the point about the importance of taking forward constitutional change on the basis of consensus rather than simply imposing change, as this Bill is doing. The Deputy Prime Minister-the leader of the Liberal Democrats-has brought forward a Bill changing constituencies in a way that is fair only to the Conservative party. Some Liberal Democrat leader he is. The proposal is grossly unfair to Labour and especially and blatantly unfair to Wales, which will lose fully a quarter of its representation. It is also grotesquely unfair to local communities, imposing on them new constituencies from Whitehall and depriving them of their traditional rights to be fully involved in a process that is at the very heart of our system of parliamentary democracy. Having swallowed a Budget that is unfair to the poor and pensioners and, quite astonishingly, most unfair to the poorest parts of Britain, including the north-east of England and Wales, now the Government are also destroying the fairness at the heart of our parliamentary democracy. They trumpet the case for equalisation of constituencies as though it were a novel concept, but equalisation has been the all-party principle behind our constituency system for generations. We are all signed up to it, but the boundary commissions have applied it in a flexible way over the generations, and in a way that is independent and takes proper account of local views, community identity, rurality and sparsity. In other words, the boundary commissions have operated the equalisation principle by consensus, in a way that is fair, practical and sensible. The Government have abandoned that consensus, in a way that is unfair, impractical and arrogant. Mr Jeremy Browne (Taunton Deane) (LD): I have 84,000 constituents. How many does the right hon. Gentleman have? 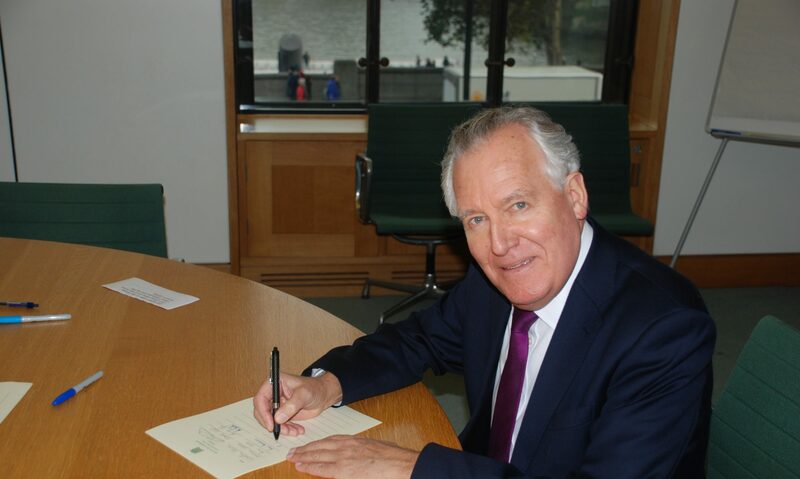 Mr Hain: I have just under 60,000, although my constituency is different. I would be happy to see more constituents in my constituency if this Bill were proceeding on a fair basis, with public inquiries and taking local consultation into account. The only exception to the equalisation principle, allowing some flexibility, is in the protection given to four geographically large seats in Scotland, three of them Liberal-held. As my hon. Friend the Member for Aberdeen North (Mr Doran) pointed out, we can conclude in respect of Ross, Skye and Lochaber only that this preferential treatment was the price paid to keep its Member, the former leader of the Liberal Democrats, from defecting to the Labour party. Obviously, in the Government’s definition of equalisation, some seats are more equal than others, as my hon. Friend the Member for East Kilbride, Strathaven and Lesmahagow (Mr McCann) said. Wales, because of its own special characteristics, has always had special consideration by this Parliament and by the Boundary Commission for Wales, with cross-party support over the generations. For that reason, Parliament first decided in 1947 that there should be no fewer than 35 Welsh seats. Since then, rises in and shifts between the population over the past 60 years have led the Boundary Commission to increase the number of seats by a further five to 40. As a note from the Commons Library of 28 July 2010 confirms in paragraph 3.1, during the passage of the Boundary Commissions Bill in 1992, the then Home Secretary, the right hon. and learned Member for Rushcliffe (Mr Clarke) rejected the argument that over-representation of Wales should be tackled, referring to it as a long-standing constitutional arrangement-a point eloquently explained by my hon. Friend the Member for Caerphilly. This Bill, however, will impose on Wales the most savage cut of all-a fact that the hon. Member for Cardiff North (Jonathan Evans) actually celebrated. Wales will lose three times the proportion of MPs as the average for the rest of the United Kingdom-a reduction of a full quarter from 40 to 30. As my right hon. Friend the Member for Torfaen said, how can that possibly be justified? Wales is long used to the Tories treating it unfairly and punitively, yet now the Liberal Democrats are doing the very same thing. I hope that the Deputy Prime Minister and the Minister replying will have listened to the arguments of the hon. Member for Ceredigion (Mr Williams), who asked for the changes in Wales to be delayed at least until after the referendum, given that successive arguments are being made within the Welsh Conservative party. In the vast rural areas of mid and west Wales, the four constituencies-none Labour-held-including Brecon and Radnorshire, Montgomeryshire and Ceredigion, cover hundreds of square miles, yet under the Bill those four large seats will become two monster ones, each thousands of square miles in size. Until this Bill, every Parliament and every boundary commission has accepted an elementary verity about the Welsh valleys. In former coal mining constituencies, it is impossible to visit the next valley by the shortest route, because that happens to be over the top of a mountain. The only way to do so is by travelling either down to the bottom of the valley or up to the top of it and right around to the next one. The Bill will produce a monumental list of other anomalies. The hon. Member for Isle of Wight (Mr Turner) is absolutely right to be incandescent about the carve-up of his island constituency, but let me say this to the rest of the House. Just wait until every Member in every area realises what will be done to their own constituencies based not on natural communities, not on natural towns or parts of cities, but on an arithmetical diktat imposed by the Deputy Prime Minister and the Government on the boundary commissions. [Interruption.] Government Members shake their heads, but I predict that they will all find that when it comes to their own constituencies, there will be rebellions in their local areas against this diktat from the centre on an arithmetical basis. What we are seeing and what people find most offensive about the Bill is the way in which it sweeps away local democracy, as the hon. Member for Foyle (Mark Durkan) said. For generations, constituency boundaries have been reviewed and adjusted by local agreements, not by central imposition. Local people have had the opportunity to object if community identities were threatened or unsuitable mergers with nearby towns or villagers were proposed. Formal hearings would hear representations, and a final decision would be agreed, if not always by total consensus then at least with broad support. Last time, the process necessarily took fully seven years in England. The Bill has unilaterally dumped that process for a rigid two-year deadline in a straightforward fix, abolishing the right to trigger public inquiries and destroying a bipartisan, independent system of drawing up boundaries, which has been the envy of countries elsewhere in the world. So much for big society localism. The Prime Minister tells us that the big society is about “empowering local communities”-a favourite phrase of the Deputy Prime Minister. As the hon. Member for Aldridge-Brownhills (Mr Shepherd) has said, however, the Bill destroys the essence of the British parliamentary democratic system, by imposing from the centre rather than developing from a pattern of constituencies. It rides roughshod over and breaks up local communities, as my hon. Friend the Member for Slough (Fiona Mactaggart) said. It proposes an arbitrary and partisan reduction by 50, to 600 seats, because that would hurt Labour most. A steeper reduction would have abolished too many Conservative seats.